LONDON (AP) A former top United Nations official cited FIFA leaders who ”violate … standards of good conduct” when she resigned from a role monitoring integrity at soccer’s world body. South African judge Navi Pillay said in an email published on Friday that FIFA put ”undue influence” on her governance committee colleague Miguel Maduro, who barred Russian deputy prime minister Vitaly Mutko from re-election to FIFA’s ruling council. 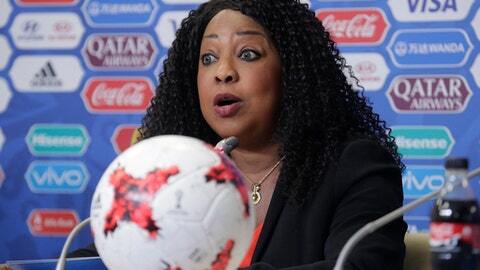 The former U.N. High Commissioner for Human Rights resigned in May – days after FIFA ousted Maduro – in an email to FIFA secretary general Fatma Samoura now published by a British parliamentary committee. Pillay told Samoura, who left the U.N. to join FIFA last year, that its integrity rules guarded against ”improper interference, exercise of influence or pressure” on officials who were appointed to be independent. ”I adhere to principled conduct at all times; and cannot countenance serving in an institution, whose officials violate the norms and standards of good conduct, that they themselves adopted,” Pillay wrote. Maduro met with British lawmakers on Wednesday and told how Samoura and FIFA President Gianni Infantino pressured him to protect Mutko. Blocking Mutko over rules prohibiting government interference would be a ”disaster” for the 2018 World Cup and threaten Infantino’s presidency, Maduro claimed Samoura told him. Mutko was forced to give up his FIFA Council seat representing European soccer, though continues to chair Russia’s committee organizing the 2018 World Cup. Maduro’s ouster provoked three independent colleagues to resign in protest: Pillay, corporate human rights expert Ron Popper, and New York University law professor Joseph Weiler. Weiler confirmed this week he has filed a complaint against Infantino to FIFA’s ethics committee. That panel is under new leadership after Infantino also orchestrated the exit in May of chief judge Hans-Joachim Eckert and prosecutor Cornel Borbely.